Best of Young Jazz is a music education project run by Upton Jazz Association. This highly successful project grew out of Upton Jazz Festival and has been running since 2009. 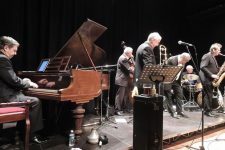 It works across Worcestershire (and beyond) with talented young jazz musicians to develop their music making skills and offer them opportunities to perform in front of live audiences. The key project aims are to: Educate, Celebrate, and Inspire young jazz musicians. The project celebrates the talents of young musicians, and aims to nurture and support music making of the highest quality. Since the project began, Best of Young Jazz has worked with over 2000 young people who have performed to many thousands of people at the Upton Jazz Festival and many other events in the region. Work with schools including resident musicians and CPD training for music teachers. Best of Young Jazz is ably and energetically led by Steve Boffy with support from Marie Oldaker and Manda Graham. Peter Johnson and Matt Hadden have ‘graduated’ from BOYJ to join the team. To deliver this ambitious project, the team have recruited many new partners, including Birmingham Conservatoire, and Severn Arts (previously Worcestershire Youth Music). The Best of Young Jazz team have successfully raised new funding from a number of sources including Arts Council England, The Elmley Foundation, The Bransford Family Trust, Worcestershire County Council and The David Morgan Trust. Thank you all. They continue to raise funds for this ambitious project and are always actively seeking support and sponsorship.